The BEST Hangers and Luggage for your Kilt. Tired of making do with skirt hangers you stole from your wife? Step up to the easy kilt storage system you deserve. USA Kilts exclusive wide 4 clip kilt hanger will securely hang any kilt -- even the heaviest 8 yard wool kilt. You may find kilt hangers for sale, for instance on outlets like amazon, however, most are of inferior wood with ordinary tin skirt hanger clips. We know because for years we looked for a good hanger to use for kilts in our store and warehouse. We finally realized we needed to design and spec out our own heavy duty kilt hanger. The result is this high quality wooden kilt hanger, attractive and sturdy, with four heavy-duty clips. Each clip is tipped with resilient rubber ribbing for a solid grip. The hanger width is just right for your kilt, yet not too wide to fit in your closet. We feel it is the best kilt hanger on the market. We’ve sold thousands and thousands of them at this point, so clearly American kilt wearers agree. We also offer high-quality kilt carrier hangers and kilt tubes. How do you keep your kilt from wrinkling? A. Get a good kilt hanger for home. B. When traveling, use the right kilt carrier case. What is a kilt roll carrier? 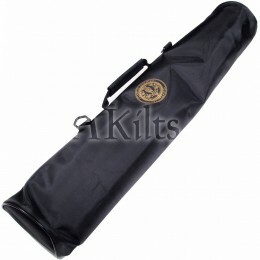 A kilt roll, or kilt carrier tube, is a simple but effective system for transporting your kilt without wrinkles. It’s a favorite with wedding bagpipers and other folks who need to travel frequently to performances. Simply roll your kilt on the mat provided, then slide it into the tube. Done. Do I need a full kilt outfit carrier? This depends on how much traveling you do and the extent of your kit. Often the kilt roll is all you need. But if you want to secure an entire kilt outfit wrinkle-free, the kilt carrier is the best option -- especially for longer trips. 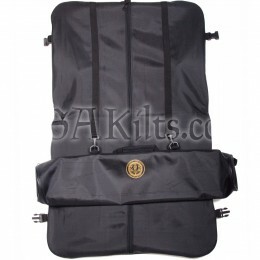 Designed for competition bagpipers, our kilt carrier bag is a self-contained garment bag system which works with our Kilt Roll, or on it’s own. Inside you’ll find kilt coat hanger loops and elastic security bands. Outside are a variety of pockets for each component of your highland wear outfit. You can separate, organize and carry it all -- your Argyll jacket, sporran, ghillie brogues, belt, shirt, etc. etc. Our kilt carry-all outfitter bag is great for anyone who has invested in a good Celtic wear outfit.